Cydia may be lauded as the most important tool in the broad mechanics that comprise the jailbreak scene, and in many respects, it is. But if you thought that a jailbreak + Cydia = all of the untethered jailbreaks you’ve enjoyed over the last few years, you’d perhaps be underestimating the contribution of several other key components. Cydia Substrate, for example, is a quiet workhorse that, without it, Cydia cannot properly work its magic, and with author Saurik having rolled out several key updates already since Pangu8 released over three weeks ago, a new version has just arrived featuring a myriad of improvements and enhancements. Details after the jump. There are a number of changes included in this update, which, as noted in the official changelog, offer a bunch of features "requested by developers". In noting of these adjustments to suit jailbreak devs, the release notes also allude to the fact that "many" extensions will now require this update, so if you are running a jailbroken iDevice, grab this update as soon as possible. 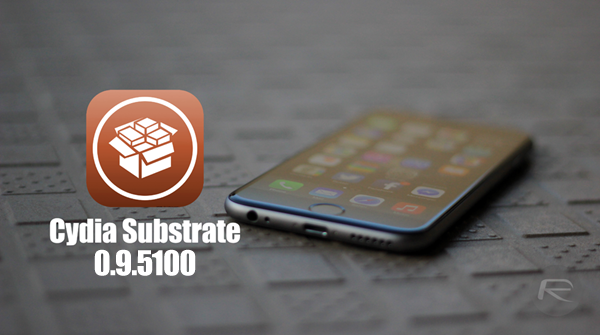 Cydia Substrate 0.9.5100 includes features requested by developers, so their extensions may require this update: it can inject into more iOS 8 daemons, find more private symbols, move more arm64 instructions, and hook even shorter armv7 functions. As you may have gleaned, Cydia Substrate is very much an "under the hood" kind of utility, and thus, you mightn’t know what these changes mean or how they’ll benefit your iOS device. Suffice to say, this is a significant update in your ongoing battle to ensure that your jailbroken iPhone, iPad or iPod touch runs smoothly and without incident, so if you have indulged in Cydia’s mystical powers, then this latest Cydia Substrate should unquestionably be a part of your repertoire. If you want to update, simply head over to Cydia, tap on the Changes tab, and look out for it. If it’s not immediately found, tap on that Refresh button, and once you have installed Cydia Substrate, make sure your device gets a reboot before you continue using as normal. Cydia Substrate 0.9.5101 fixes an incompatibility introduced in 0.9.5100 with some combinations of extensions (the most common conflict was having both CC Settings and GroovyLock). DO NOT USE PANGU8 JAILBREAK. STILL TOO MANY BUGS!!! YOU WILL BE STUCK IN CONSTANT REBOOT. Runing iOS 8.1 and Pangu 1.2.1 – no glitches thus far!!! I guess I forgot that I had to turn off passcode and did this update. Now I’m stuck in boot loop on my 6 plus. Anyway to get out of this loop? I’m at work and I don’t want to have to wait until I get home to resolve this. To resolve this you must NOT USE PANGU8. Found the subreddit and you have to hold the volume up button to go into recovery mode. Uninstalled CCSettings and back in business. There is no bootloop issue with the passcode. Why do people still persist on saying this. I jaibroke my iPhone 6 the same day Pangu8 came out, and had to manually install Cydia, SSH etc. The passcode issue was resolved some time ago. I thought that might be the case because the instructions I used to jailbreak with Pangu for Mac said to ensure it was disabled. It turned out to be CCSettings causing a boot loop. 0.9.5101 update fixes this. Now running CCSettings with no issue. Holding Volume Up does absolutely nothing. Just stuck at boot logo. No you won’t… Stop spreading disinformation. Try going into safe mode by holding volume up while it boots up. Uninstall all the tweaks. If it still isn’t resolved, may want to do a full restore and start fresh… If it is resolved, reinstall them one by one until you determine the culprit.